How can I enter a 6-digit exp. date for my Mastercard? My old Mastercard had a 4-digit exp. date. 1Password won't allow me to enter more than 4 numerals, but I need to enter 6. Referrer: forum-search:My new Mastercard has a 6-digit date, v.s.a 4-digit date. iPassword won't allow me to enter it. Hi @laura_gottwald - Thank you for contacting us. You should be able to select the expiration data from the drop down menu. Select the month and year from the menu and you should be good to go. For example if my card showed an expiration data of 04/19. 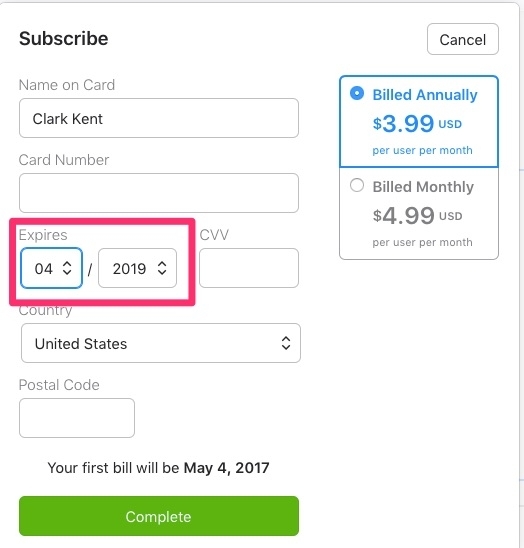 I would select 04 under the "month" and 2019 under the "year". I will include a screenshot below and let us know if you have any further questions. Yes, I get that. But the old MC had an expiration date of 05/18. The new MC has an expiration date of 09/30/21. 1Password rejects the numbers I input after the 4th number (0). It won't take the longer date. I am sure I can do that, but the full date is 6 digits, so 4 digits may not allow me to charge on the card. OK. Thank you. I'll try it tonight. Sounds like a plan I look forward to hearing back from you.